Why Are Stub Nibs Ground Flat On The Back? "Stub" nibs seem always (**) to be ground flat not only on the bottom and end, making the angle that contacts the paper and gives directional line variation, but also on the top which never (*) contacts paper. When customizing an ordinary ball-tipped nib to make a stub, why go through the extra step of grinding off the top? I know it is not necessary for writing to flatten the top/back of a round nib, nor of a CI: I have a cursive-italic nib, customized from a broad, that is an EF for writing upside-down, rather the opposite of flat. Yes, I know that a "stub" and a "cursive italic" are distinguished categories. If the distinction is relevant to my question, please elaborate on how. Otherwise not. And I also know that the "angle" I referred to above is eased or rounded on a stub nib. If that is relevant to my question, please elaborate on how. Otherwise not. I would rather not hear a bunch of guesswork answers. Those I can make up for myself. Please wait for someone who actually knows. Would it not be both less work to leave the backside of a stub round, and slightly beneficial in providing a (vey slight) extra bit of ink buffering very near the point of delivery? (*) "never" in its regular use a a stub nib. The possibilities for using the reverse of a nib are interesting. That's a different set of questions I am not asking now. I just want to know why stubs have those possibilities ground off. (**) "seem always" because every stub nib I have examined, and every close-up photo of a stub nib I have seen, and the instructions I have read for grinding a stub, all show this feature. But I have not done a survey. If there are some stubs that do not have the back ground off, please show a picture. In any case my question remains for those that are ground off: Why? The rare earth is more valuable than gold....can be saved and remelted...............one idea if stubbed at the factory. I have mostly German '50-70 semi-flex stub nibs....and they unless they made a K nib....kugal nib...the round ball on top of the nib..................never tipped the top of the nib as was. Those nibs....if with touch of flex..........semi-flex or maxi-semi-flex, were stubs from the factory....there were no American Bump Under to start with. Wow...you are Right! Francis stubbed my fat and blobby 605 BB...................and he did the top too. Why.....well I think so the fat and blobby tip of the nib could be thinned also.......I had not asked for a K nib....one with a thicker tip and a ball on top of the nib. (I have a couple vintage ones KM's .....stub on the bottom and thicker point and a ball of tipping on top, for those who wanted to write like a pencil or those newfangled ball points. Modern Pelikan is the Double K, double ball nib with a thicker tip so ball point barbarians don't have to waste three minutes of their life and learn to hold and write properly with a fountain pen.....behind the big knuckle.......................they can continue to hold a fountain pen like a ball point, before the big index knuckle. Nib has to be nail or semi-nail so the ham fisted don't bend it so easily. So if you want a stub....you are holding it behind the big index knuckle and by taking off the top ball, you thin the tip back down to semi-vintage or vintage tip width/thickness. It gives you a cleaner line. A quick answer to a new question to me. Sounds logical to me....but logic and fountain pens don't always go together. DIY stubbing could well leave the top untouched....and the tip of the nib still fat and blobby, in that might not be thought of. Had I done mine at home...............I'm sure I'd not thought of taking off the top to thin the tip. So there is bound to be hundreds of home made fat topped and tipped stubs....limping around. Edited by Bo Bo Olson, 18 March 2019 - 21:36. Johnston always talked about the "finest thickness" could only be gotten in a feather nib by scraping the nib until as thin as possible. At first, I thought his book was talking about the flexibility of the nib. Later, after working with grinding nibs to stubs for years and cutting a few feathers myself, I realized that the capillary flow area was lessened by using a thinner nib. In other words, a stub nib works best with a smooth, even ink flow. The thinner the nib, the less the volume of the flow. So by squaring the nib and grinding a long lead-in on the stub, the more dependable and smoother the ink flow. Giving the writer the time to do italic properly. Or add a few flourishes to a Gothic hand. So that is why I always square off the nibs I grind. From a person's actions, we may infer attitudes, beliefs, --- and values. We do not know these characteristics outright. The human dichotomies of trust and distrust, honor and duplicity, love and hate --- all depend on internal states we cannot directly experience. Isn't this what adds zest to our life? Great info Randal, after reading for a decade*** ....this is the first time such info came my way. ***Having lots of '50-70 German semi-flex stubs didn't need to stub anything........along with having a BB factory stubbed '38 Vac, and a maxi-semi-flex factory BB Snorkel was pretty good to go. I finally got that 605 BB stubbed. I'd swapped in a nice M for the BB in I knew some day I'd either stub or CI it....................some day took a hell of a long time to come. I had few American Bump Under nibbed pens. I never got around wasting a nib or two to learn how to stub...so sent my 605 to a pro...Francis..my Lamy Persona to one too; PB who took a nail no line variation OB and made it a very nice CI. My stub is a bit thinner tipped than my CI..But the Pelikan was a modern fat and blobby nib, while the Persona was a normal semi-vintage tipped nib....not fat and blobby. Edited by Bo Bo Olson, 19 March 2019 - 11:51. I imagine for the reasons Randall outlined that many factory stub nibs never get tipping. Why put tipping on it to grind it off? The German vintage stubs had minimum tipping. Osmia even less....got a couple OBB's there is only a flat thin pad in the middle (Osmia was always going broke so was saving money in any rare earth 'iridium' including their minimum compound was more expensive than gold. ...............the reason they were tipped is simple....the nib had to last 7-10 years of constant use. Pelikan had a thicker tipping than some of the semi-flex stubs I have from that era. Have 28 semi-flex and 16 maxi-semi-flex....of which 16 of both flexes are oblique. Modern stubs might not have too. Osmiroid were not stubs but Italic nibs and were cheap enough to replace............besides which I doubt if they were the primary pen of the user back in the Day of One Man, One Pen. Was Randal speaking of gold nibs or the tougher steel nibs? A nib without tipping is not ground flat on the back -- the steel is already flat. A feather nib (made from an actual bird feather) does not have tipping ground flat. A nib made cheaply with tipping that wasn't a ball to begin with isn't ground on the back (much). A ball nib isn't a stub. There was a hint that narrowing the capillary flow path made flow smoother and slower. Seems odd, but I don't know. So, what about the original question? Line variation. Stub, Italic, and Cursive Italic nibs are ground on the top. Remaining ball on top will give one a nice, unwanted, fat horizontal line, when one is looking for thin. That's a bit startling -- that a ball on top, where it does not contact the paper, will cause a fat horizontal line. What is the evidence? To the contrary, we know that this is not the case when using a ball nib (say, a Medium) that writes Fine when upside-down. The Fine line is not made fat by the big ball that does not touch the paper that way. So why would a ball affect the horizontal line of a stub? I have a couple K nibs....Kugal, is a half a round ball on top of the nib and the tip is a bit thicker, in someone wanted to hold his fountain pen before the big knuckle like a pencil....them new fangled ball points were just coming int. One is perhaps KEF....not really marked on my post war Pelikan 100n just a K), have a KOB MB and a couple KM pens from the '50s. With the ball on top, the tip of the nib is fatter.....has to be to write vertical. How ever all are stub flat on the bottom.................those are German pens not American ones with the American Bump Under. Modern Pelikan 400/600/800/1000 are double kugal....double ball nibs with fat tips....one of the reasons they are fat blobby characterless nibs...................How Ever.....no ball point user has to waste three minutes learning how to hold a fountain pen if he buys a Pelikan....unless it's a 200. OK! Now we're getting somewhere. How are these ball-on-top, stub-flat-bottom nibs shaped on the end -- round where the ball meets the flat? How do these nibs write when held at a fountain pen angle? Is there line variation, wider vertical strokes than horizontal? Especially the Mediums? Is there "character" in some other way? Edited by BrassRatt, 04 April 2019 - 05:02. You can hold it like a pencil/ball point before the big index knuckle, or behind it like a fountain pen....your choice. Held like a fountain pen you do have a clean line.....it is a stub. 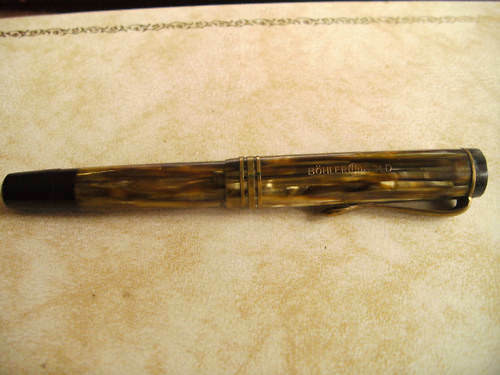 I hold it like a fountain pen, in I learned how...............but even then some folks liked to hold it up like a pencil..............ball points were real new fangled then in the mid-50's. I have not tested it to """Remaining ball on top will give one a nice, unwanted, fat horizontal line, when one is looking for thin."""" in no one else mentioned that .....in or around when I got said pens 6-8 years ago. This is an EF....not my KM 790. 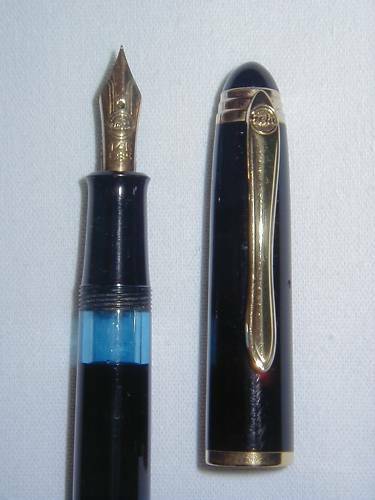 A '60-72 pen. With three rings on the final. This is my '59 true three ring 790 in M. When I buy a pen I get the picture, the finial polished up good, better than the picture. Both are semi-flex M nibs. Geha nibs were made by Degussa or Bock and are a tad better than Pelikan. Two posters I respect said so, so I tested my 4 Gehas from that era vs 4 of my Pelikans from that era. '50-65. Torpedo/cigar shape was IN, Swan, MB 146/9, Pelikan 140/400nn and the Geha 790 and 760. I will let you know in a little while..........had I not stupided out, I could have done it now. But I had put my KM in the empty pen cup....and forgot it had the reserve tank....so it took quite a while to clean out.....so have to wait with the nibs wrapped in a paper towel instead of just filling both. The M was clean. So we can see what difference there is between a KM and a M semi-flex nib.....well I can....don't do pictures.....might try....don't know. Think I'll use GvFC Moss Green and the new Pelikan dark green that I've not used yet. It is entirely my fault that the Geha 790 costs up to E60 today, instead of the up to E19 when I started buying a decade ago.....must have paid E30 for the three ring one....back when Pelikan 140 was going for E50-70. Been raving about the 790 for a decade. Geha 790 is the Best Buy in semi-flex....one can find them for less than E60...and E60 would be a max if one can Hunt on German Ebay.......if you are a Buy Now Idiot button pusher.......you can get super high stateside prices in German Ebay also, if you look, in the buy now section instead of looking in the auction only part. The Geha school pen which looks similar, having only the clip ring under the final instead of two or three rings and a serial number can be had from E12 to E19....unless you want to buy from a German Pirate on US Ebay for only $89.00. The Geha school pens are the best buy for regular flex.....so much cheaper than the vintage Pelikan 120 and as good or better. (regular flex is what the rest of the world once called Japanes 'soft' before Japanes pens become more than local home nitch market pens in the mid-late '90's. Gehas are very solid well made piston pens, that have great balance. 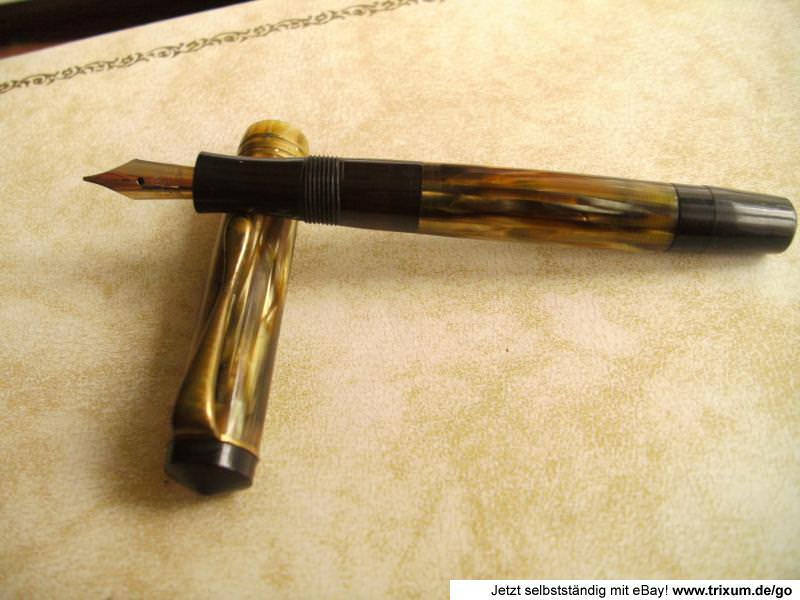 Do Not buy the Geha Cartridge pen....you can not get a cartridge to fit it......Geha was the first German pen company to make a cartridge pen, so made a cartridge to fit theirs....when Pelikan came out with their cartridge pen Geha altered theirs to fit Pelikan on the back side of the Geha cartridge. There have been no Geha cartridges made since 1972. I tried to get some made at the Cartridge factory in Slovenia but they never got back to me after I sent a few of my rare cartridges to them. It's good to review things even if one is not doing anything every few years. Indydance has a new stub tipping....very neat. Could well be usable........... grumble squared. I did not want a CI...so had a nib stubbed....had I been aware of Linda's new style....I could have had that. ....................OK, a Geha like a Pelikan has a screw out nib. You know how disrespected M nibs are here on the com. The true three ring Geha 790...is not a M as marked....it is an F/EF....Yet another one of them dam EF's. Eventually My '38' Boehler Gold mdl 54 full tortoise came to the rescue. Vintage and semi-vintage nibs are 1/2 a width narrower than modern. I ended up inking a few more pens that originally wanted....with Pelikan 4001 Dark green. The Geha 790 KM was inked with G v FC Moss Green. Perhaps I should have looked for a bit wetter dark green...Aventurine? for the Boehler. KM results, the pen writes wide for vintage M...close to B. Whole line is fat, held low like a fountain pen or high line a ball point. The thicker tip makes it so, compared to the regular stubbed late '30's Italian semi-flex.........if one orders nibs as a company, Pluma would do it German style flat stubb. Even back in the Day there was tolerance and slop. My maxi-semi-flex Osmia-Faber Castel mdl 540, M writes a bit wider even if as light as I can go....Same size as the Boehler 54 just later and with a new number once Faber-Castel took over Osmia. Osmia had 4-5 different clips and finials.......the only reason I could think of was one didn't want to show up the boss by having a better pen than him. 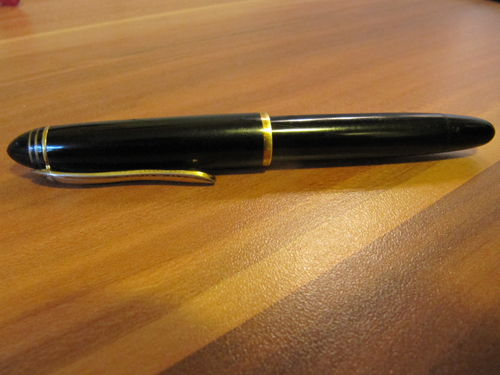 Fear of Bosses might well be why most German pens other than Pelikan were mostly black and gold. Pelikan 400 OM writes close to the Boehler....but is here and there is thinner. The Geha 790 KM seems to be fatter through the whole writing with out the occasional thinness in certain letters. """Remaining ball on top will give one a nice, unwanted, fat horizontal line, when one is looking for thin."""" I have to go with this a bit....but a KM does seem to make the whole nib write with thicker lines, and even the T crossing is thicker, than the non-Kugal nibs. I use ...Lets see What is What....often, to see what is what. Edited by Bo Bo Olson, 05 April 2019 - 16:47. From my personal observation the mirroring of a grind on the nib top allows for easier orientation against the surface of paper when writing. Basically, I find it harder to use a stub with a rounded top. I'm not saying it's impossible but not intuitive.